It is hard not to notice that many companies have certain fandoms. A person may happen to become a fan of a brandname. In the IT business, the best example of such tendency is Apple, Inc. Not that the quality of Apple products did not correspond to their prices, but we must admit that there are many people around the world who prefer to buy Apple products (iPods, iPhones, iPads, etc.) only because of the famous Apple logo these devices carry, without actually paying any attention to the technical specifications of both Apple devices and similar devices of their competitors. However, it is not only Apple, Inc. to enjoy such phenomenal popularity. For example, over the last few years Android OS has gained popularity not only among manufacturers of smartphones and tablet personal computers, but also among common people using these devices. The Android OS has an oval-shaped green creature with two antennas on its head for a logo, but the picture of this creature can not only be seen on the screens of AndroidOS-operated mobile devices, but also on t-shirts, sweaters, and other kinds of merchandise. Recently, these Android OS merchandise-producing guys have decided to go even further. 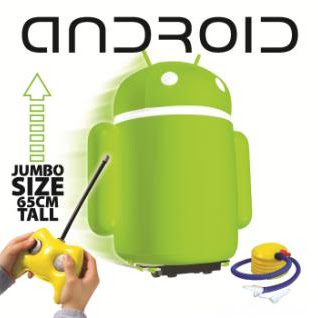 This time, they have introduced an air toy which looks like that green creature from the Android logo. The toy is about 65cm or 25 inches tall. This new Android toy is also a tumbler, i.e. it keeps to vertical position all by itself. Probably, one of the biggest attraction of this toy is that it is radio-controlled. The remote control of the toy can operate in three frequencies - so, in one are people may play with up to three Androids. This means, that you can make battles between the toys! All these factors make the new Android Air Toy a perfect present for an Android fan. The price of the new Android Air Toy is around $80.